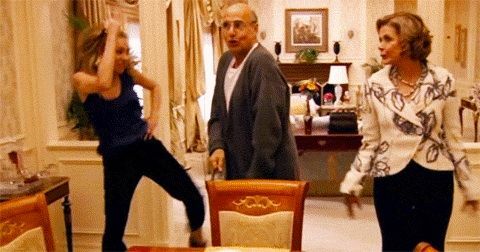 This weekend marks the glorious return of Arrested Development, which means we've been drinking heavily and reflecting on the great cultural legacy the Bluth family has left, mostly in the form of chicken dance. We've collected them here for your pleasure. A little history. Gob first performed the chicken dance when the Bluth boys went to Mexico. This created some problems since in Mexico this gesture is the equivalent of telling someone, "You dance like a homosexual." Gob soon proved to us that an ill-executed chicken dance can result in injury. Which is why it's a good idea to wear a helmet. Lindsay's variation may be a little more chicken-like. At the very least she gets the little comb. And Lucille ... Well, she's just fabulous, isn't she? George Sr.'s incites what might be the best scene in the entire series. This has to be the platonic ideal of television. Though it prompts Michael's exasperation. Here we see the Bluth family's chicken dances, in all its forms. There's one missing component that hopefully this weekend's reboot will rectify: we never saw a chicken dance from Buster, the youngest of the adult Bluths. We have gotten a taste of his moves though.